By Mateusz Mucha, Joanna Andrzejewska and Filip Derma. Why use the concrete calculator? This concrete calculator allows you estimate how much concrete you need for a specific area, and how many bags of cement are required for this space, accounting for concrete density, weight, and spillage. Cement is usually sold in bags. If you know the size of a bag (it should say how much concrete you'll get out of it on the bag) our calculator will help you find the amount of bags you need to buy. This way you can also estimate the concrete slab cost. If you would like to estimate the amount of concrete you need for columns, check our sibling calculators for concrete columns and tubes. 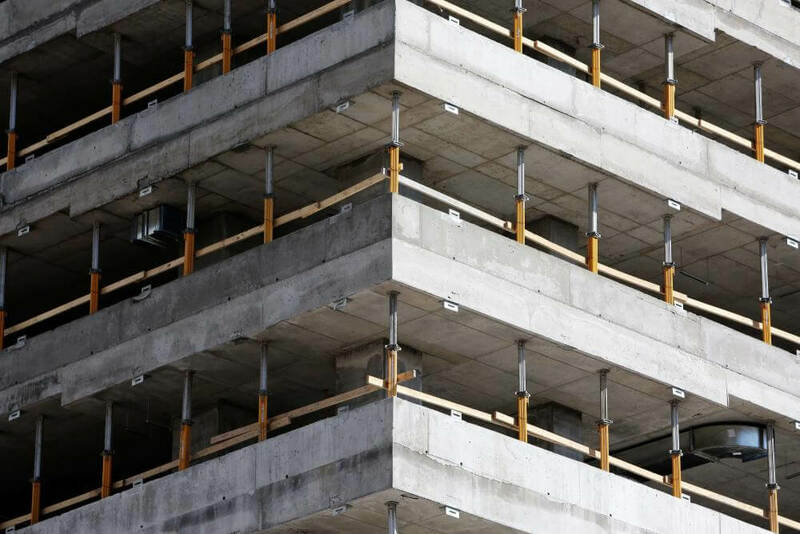 Nowadays, concrete is one of the most common materials used globally in construction. It is composed of fine and coarse aggregate bound together in a fluid cement (cement paste) that hardens over the time. Aggregates are usually sand and gravel (or crushed stone), while the paste is water and portland cement. Portland cement is not a brand name - that is the generic term for the type of cement used in basically all concrete (like how stainless is a type of steel). Through a process called hydration, the cement and water harden and bind the aggregates into a mass similar to a rock. After 28 days concrete achieves around 99% of maximal compressive strength. However, this hardening process continues for years, resulting in stronger concrete over time. You may have been in a situation similar to this: you have decided to build your own house, a terrace or a fence. You go to a shop, buy X bags of concrete, and, pleased with yourself, you get to work right away. Somewhere in the middle you realize you have only one bag left. Irritated you go back to the shop, buy another batch of concrete, go back, start working again and then... it's not enough. Again. The day's already over, the shop is closed, work's not done and tomorrow you need to go back to the shop again. Only this time, annoyed, you buy much more, and by the end of the project you're left with half of all these extra bags of concrete with absolutely no use for them. You wasted time, you wasted money and it most certainly got on your nerves. All of this could have been easily avoided, with assistance from our calculator. You'll never have to wonder "how much concrete do I need?" again. First, you need to estimate the volume of concrete that you need. Provide the dimensions (length, width and height) and quantity of your concrete slabs or an area that you want to pave. Determine the weight of all of those elements - this is how bagged cement is sold, they tell you how much the concrete from the bag will weigh (for example, you'll get 60 pounds of concrete out of one bag). Given the volume we just calculated, and the concrete's density (again, you'll find this info on the bag, we provided a common value, but it varies), you can calculate the weight of all your elements. Provide the size of the bag, so we can find out how much concrete is produced per bag. Finally, you can provide the waste ratio - how much you think you will lose via spillages, defective elements and other unfortunate events. Now you know how many bags you truly need. All dimensions are given in feet by default. You can change them to any other unit by simply unlocking the field (the padlock button). So let's say we have 4 concrete elements, each 3 feet long, 3 feet wide and 3 feet high. Now we multiply 4 times (3*3*3). Pre-mixed concrete is usually sold by the cubic yard, and this unit is used by default. As construction elements are usually measured in feet, our calculator converts the volume into cubic yards - in our example 4 cu yd (108 cubic feet). Sometimes you'll know how many slabs you need. Other times you'll just know the area that needs to be paved - feel free to provide any of these values. In our example, we are paving 36 square feet. Once we have the above measurements we can get to the essence of the matter. Check if the density of the concrete from a particular producer is the same as the default value in our calculator (150 lb/cu ft). Feel free to change it as needed. Now, the total weight of concrete you need is shown. Check if the weight of a single bag of cement is the same as the default already given (60 lb). If not, again, change it to the appropriate number. To be safe, account for spillage and waste. Experienced contractors usually assume 5-10%. In our example let's leave the default measures. We need 4 cubic yards of cement, our producer sells cement in bags weighing 60 lb with a 150 lb/cu ft density. The total weight of concrete that we need is 16,201.03 lb. Assuming 5% is lost to waste and spillage - voila! we need 284 bags of concrete. This calculator makes working the cost of a concrete slab easy - once you know how much concrete you need (in bags) and how many slabs you'll produce out of it, simply provide the price of the bag and you'll receive the concrete slab cost, a cost to pave your desired area, cost per unit of volume and the total cost of the material you need. The production of concrete is quite time-consuming. In this process, various ingredients are mixed together - water, aggregate, cement, and any additives. Once the ingredients are mixed, workers must cast the concrete in place before it hardens. In this modern age, most concrete production takes place in large industrial facilities (concrete plants). Careful proportioning and mixing of the ingredients is the key factor in achieving a strong and durable concrete. Not enough paste will result in rough, honeycombed surfaces and porous concrete. A mixture overloaded with cement paste will be easy to place and will create smooth surface but will result in uneconomical concrete, susceptible to cracking. Here is one of the main reasons why cement and concrete are so often confused: there is cement in concrete. When cement is blended with water, it creates a paste. Then, that paste is combined with aggregates like gravel and sand to create concrete. Cement is made from calcium and silica-rich materials (such as limestone and clay). It has the unique adhesive properties that make it an excellent binding agent. On its own, cement is prone to cracking. Compared with concrete, which can last hundreds of years, cement is much less durable. Ordinary or plain concrete - one of the most commonly used. Made of cement, sand and coarse aggregates. Lightweight concrete - density lower than 1920 kg/m³. It has very low thermal conductivity. High-density concrete - also called heavy weight. The density varies between 3000-4000 kg/m³. It is mostly used in atomic power plants (good radiation protection). Reinforced concrete - most important type. In this concrete type, steel in various forms is used as reinforcement to give a very high tensile strength. Precast concrete - the term refers to prefabricated concrete blocks. They have various shapes. Prestressed Concrete - a special type of reinforced concrete in which the reinforcement bars are tensioned before being embedded in the concrete. Air-entrained concrete - specially prepared plain concrete in which air is entrained in the form of thousands uniformly distributed particles. Glass concrete - recycled glass is used as an aggregate. Rapid hardening concrete - mostly used in underwater construction and road repairing. Asphalt - the combination of aggregates and asphalt. Used to build highways, airports, and embankments. Lime concrete - lime is used as a binding material with aggregates. Used on floors, domes, etc. Roller compacted concrete - very small amount of cement in mixture. Mostly used as filling material. Stamped concrete - ordinary concrete with some little differences. Mostly used for architectural purposes. Pumped concrete - used for high rise buildings. Vacuum concrete - a higher quantity of water is added to the concrete mix, and then the mixture is poured into the formwork. Permeable concrete - water is able to pass through it. Used in areas where storm water is an issue. Sprayed concrete - it is fabricated in the same way as ordinary concrete, but the way of placing it differs. It is pneumatically projected at high velocity onto a surface. Used in tunnels construction. Ready-mix - prepared in concrete plants and transported via concrete mixer trucks to allow for delivery prior to setting time. Self-consolidated - compacted by its own weight. There is no need of performing manual compaction. Now, although this was relatively easy; determining the volume of elements other than rectangular might be a little bit more tricky. To work out the volume of other common three dimensional object, go to our volume calculator. While we're on the subject, check out the density calculator, where you can calculate the density of any given object based on its weight and volume. Mateusz Mucha, Joanna Andrzejewska and Filip Derma. 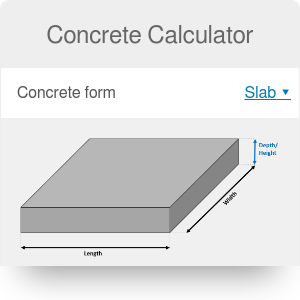 Concrete Calculator - Slab can be embedded on your website to enrich the content you wrote and make it easier for your visitors to understand your message.